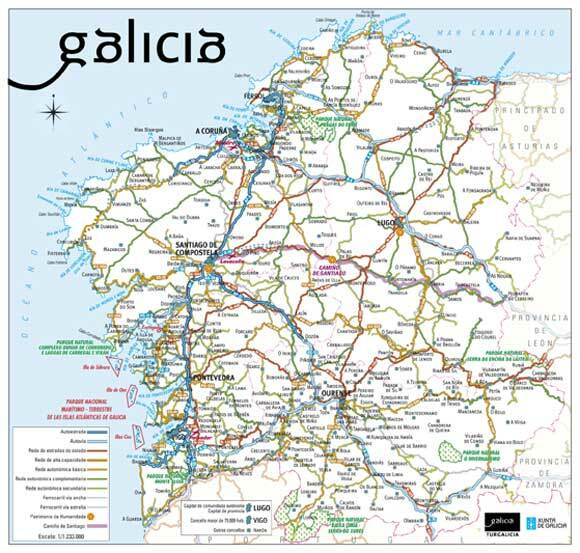 A good map is important for planning a trip, so also for planning your trip to Galicia. We would like to point you to the various maps that we have available, that you might find interesting and useful. Road map, click the link towards the top to download a high quality map in pdf format. Tourist map, click the link towards the top to download a high quality map in pdf format. A Camino de Santiago map, click the link towards the top to download a high quality map in pdf format. Map of natural parks and natural spaces in Galicia, click the link towards the top to download a high quality map in pdf format. Map of golf courses, click the link towards the top to download a high quality map in pdf format.